Acorn Bank estate has much to offer the visitor – outstanding views across parkland towards the hills of the Lake District, woodland walks along the banks of Crowdundle Beck, industrial heritage and a working water mill. In sight from anywhere in its walled gardens is the Penrith red sandstone house, parts of which date back to the 16th century. The estate was first owned by the Knights Templar in 1228 before becoming (for almost 400 years) the home of Thomas Dalston and his descendants. In 1950, its last owner, Yorkshire writer and traveller Dorothy Una Ratcliffe, gave the house, gardens and estate to the National Trust. The 17th century walls at Acorn Bank shelter the National Trust’s largest collection of medicinal and culinary plants in a fascinating herb garden. The traditional orchards are carpeted with Edwardian daffodils in spring and with wildflowers in early summer. Today, close to the house, the oldest part of the garden is undergoing significant conservation work. This area has a ‘sunken’ feel to it with alpine terraced beds along one side and an ornamental waterlily pond – home to all three species of newts native to Britain. Beyond the walls, the new orchard contains an expanding collection of northern apples, in between which we grow fruit and vegetables in a mixture of beds and hotbeds. Tucked away in the corner are beehives managed by Penrith Beekeepers Association and used for teaching beekeeping skills. Acorn Bank has chosen two spaces ideal for enjoying the peaceful atmosphere of the estate. The Herb Garden, fully enclosed within brick walls, is a space which feels intimate and reflective. 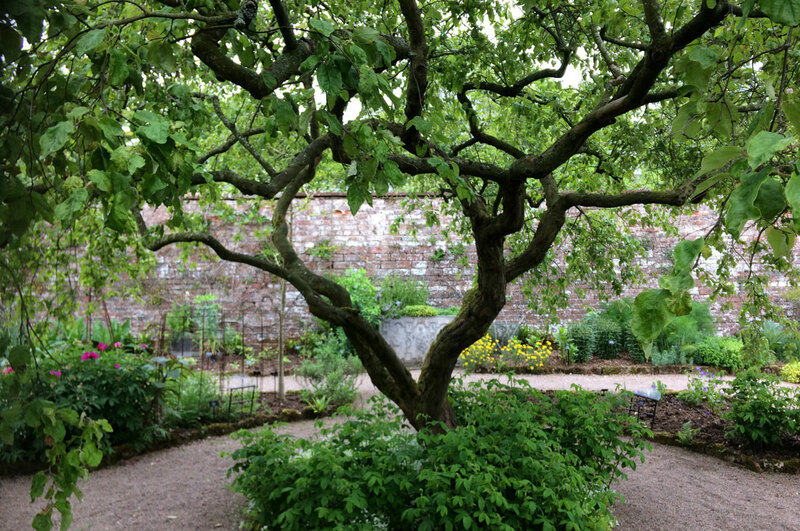 Sit under the Portuguese Quince tree with the Apothecary’s Rose in full flower. Read a book, or just enjoy the peaceful , secure atmosphere while you wander through the collection of plants that record our connection with the plant world. The Pool in the woodland is a delightful spot for sitting quietly and watching the wildlife around you. Switch off from the hustle and bustle and spend five minutes getting in touch with nature. Enjoy the stillness of The Pool while, in contrast, Crowdundle Beck tumbles behind you.